Pure Leaf Tea. 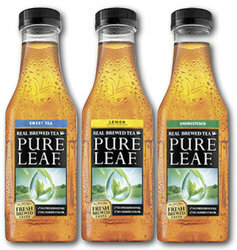 Enjoy the pure and fresh taste of tea, straight from the leaf to the bottle. Each bottle is 18.5 oz of all natural real brewed tea. There are 4 great flavors to choose from: Sweet Tea, Sweet Tea with Lemon, Unsweetened Tea and Extra Sweet Tea. 4 Great flavors to choose from. Mix and match your flavors below!